Text Target 1 Spell/Trap Card on the field; destroy it. 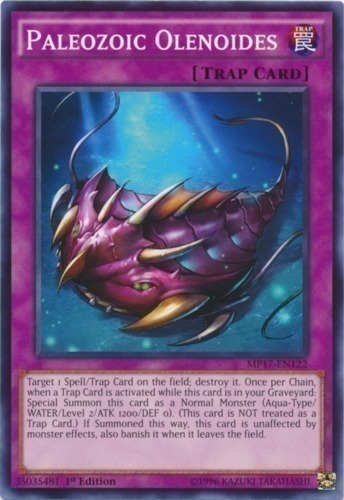 Once per Chain, when a Trap Card is activated while this card is in your Graveyard: Special Summon this card as a Normal Monster (Aqua-Type/WATER/Level 2/ATK 1200/DEF 0). (This card is NOT treated as a Trap Card.) If Summoned this way, this card is unaffected by monster effects, also banish it when it leaves the field.